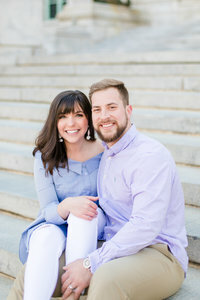 We are Andie and Tony, a husband and wife photography team based in Southern Maryland. At our core we are storytellers who are passionate about Jesus, marriage, and documenting love. This blog is like our home and we are excited to welcome you into it! You’ll find more about our life, our business, and the things that bring us more joy than we could ever explain. Grab a cup of coffee (or that glass of wine) and click on our latest post! Hi, we're andie & Tony ingagliato. We had a doubleheader this past weekend! Saturday, we photographed Kadie & Patrick’s wedding at the State House in St. Mary’s City, and then Sunday we had the honor to celebrate with Caitlin and Anthony’s (let’s be real, we’re on a nickname basis now – AJ!) wedding in Southern Maryland at the Charles Soil Conservation District Farm! Now, if you’re anything like me, you’re already on your phone, Google-ing where the CSCD Farm is and what other weddings have been there, and I’m going to give you some insider info – there has NEVER been a wedding here, until now! Caitlin and AJ are the only ones who have ever exchanged vows at this farm! Caitlin’s sweet Dad actually works here, and they were so kind to let Caitlin and AJ use the entire building and surrounding land to celebrate their Southern Maryland wedding! We honestly don’t even know where to start with this wedding. Caitlin is such a well-loved bride – she got to have a daddy/daughter first look, a first look with all of her brothers, AND a first look with her (now) HUSBAND! Her brother’s (all four of them!) and father walked her down the aisle, and then her brothers even serenaded Caitlin and AJ during the ceremony with a sweet song! One thing that the pastor had said during the ceremony was that every day in marriage is not going to be EASY, but it will be WORTH it, and in that moment I looked over at Caitlin and AJ and then I looked over at Tony – and I thought, marriage is the biggest blessing that God could have ever given us as humans, yall. Seriously. To know that in all of your times of struggle, the last nights of work, the arguments, in times of grief of lost loved ones – God gave us each other to have and to hold at the end of each and every day! A partner to pick you up when you’re not feeling up to doing all of the things that you need to do and to love you with grace when it seems no matter how hard you try, you can’t get back up. I honestly can not think of a more amazing thing, other than God’s love. Caitlin and AJ, we wish you the most wonderful marriage surrounded by all of your family and friends. You’re going to have the BEST honeymoon in Florida and we can’t wait to see pictures!! We loved working with these amazing people who made this wedding so so beautiful! « Our Best Friend Is Pregnant!